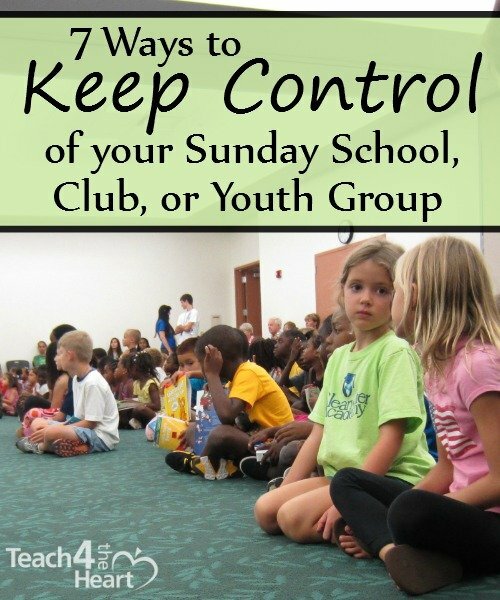 Managing your class at school is one thing, but keeping control of a less-structured class like Sunday school, a club, or a youth group is a completely different matter. In school you can be super structured and controlled, and you can give consequences when needed. But in a church or club atmosphere, that’s not normally the way you want to go. Typically the goal is to be more laid-back and informal. And you probably don’t want to come down strong on a kid unless things are really getting out of hand. This presents a unique challenge. One I experienced again first-hand a couple days ago. Our church has a Wednesday-night program for kids called Glory Stars, and my husband and I teach 6th grade. Normally I just have a handful of girls in my class, but due to a different schedule and a larger-than-normal turnout, I found myself standing in front of a mixed class of about 13 on this particular evening. I know, honey. I know. This is pretty embarrassing. I’m always writing to all these teachers about classroom management & I am definitely not managing this very well right now. Now if you have a strong, booming voice that commands authority (like my husband does), you can just yell “Quiet!” and you’re pretty much good to go. But I do not have that voice – and that’s not really my style anyhow. So what do we do in these situations? As you can tell, I’m no expert. But I have picked up a few ideas over the years – ideas I’d better keep in mind next time the boys crash my class. Use class response sayings. I haven’t pulled these out yet with the 6th graders because I never thought I needed them till the other night. But maybe that’s the point. Maybe this is something we should teach them preemptively – then they are used to them when we do need to get their attention quickly. In case you’re not familiar, you teach your kids to respond to a prompt. For example, if you say “1-2-3” you teach your students to respond with “eyes on me.” The fact that they have to say “eyes on me” automatically helps them stop their own conversations and focus on you. Or, you can use a clapping pattern where when you clap twice they clap 3 times in response. It doesn’t really matter what the pattern is (as long as it’s easy to remember). The key is that you’ve got to practice it at least 3-5 times with the kids and then continue to practice and review periodically. If you do this right, though, you can quiet a full classroom of kids in about 10 seconds – without yelling. Move a disruptive kid. If a kid is not responding to your gentle correction, don’t be afraid to move him. Simply tell him to move to the back row. If he tries to argue just calmly say, “Yes, please move now. Thank you.” Then stop and wait for him to move. Use your workers. If you have other workers or helpers in your class, talk to them and tell them how they can help you. For example, ask them to sit with the kids so that they can help you get control when needed. It’s also a great idea to discuss with them how you want the students to behave and when you want them to step in and correct a student. Give the “What were you thinking?” look. This is a great way to subtly correct a kid without having to say anything and without having to delve into the details of the situation. If it looks like something questionable is going on, just give the kid(s) a half-confused look with a shake of the head that says, “what were you thinking?” That way they know that you know. And that’s often enough. Don’t forget all the things that work in your classroom. Even though the class is less structured, there are a lot of strategies that do carry over. So continue to develop relationships with your students. Get the parents involved when needed. Deal with problems while they’re still small. And when a problem is persisting, talk honestly with the kid to deal with the root of the problem not just the surface issue. I’d love to hear your ideas. What else helps you keep control of a less-formal class? What Does “Judge Not” Really Mean? Thanks for these ideas. We have a small but growing church where we have an unusually large amount of kids. It is hard to keep control with so many in a small area. We have lots of helpers but I have found that finding teachers who have good classroom management is much harder. It’s been difficult for me to figure out how to teach it. Thanks for putting these down on paper! My tough crowd is the 6-8th graders. We play this game ( I modified it somewhat) called “Hot Seat (Scripture Lady.com). I used it to break up the lesson, sometimes transitions, sometimes to interrupt before they get bored. We use an app for drawing names from a bag and an app for a spinner. The first week 2 or my 3 tough guys were in the hot seat. Imagine being able to tell their parents that they were in the hot seat and they should ask their son about it. The son knowing that they were not in trouble (bragging rights do go a long way) were on my team now. I turn the lights off and on it seems to get their eyes and ears back on me. The local public school uses the peace sign to get everyone quieted down, so we modified what the kids do and made it more meaningful by pointing our finger into the air to 1) remind others that Jesus is watching and 2) those choosing to be quiet and obey are also choosing to put Jesus first. It a great way to remind everyone what’s really important. Great ideas, i teach sunday school and my way to get the childrens attention is to get them to say a sentence. I normally say ” when im talking” and the kids say ” no one is talking”. You can even give them a silent que, like start patting your head. I say attitude check and the students standup and say Praise the Lord. Works like a charm. I have a SS class full of 8 year old boys, some with a reputation for rowdiness. In addition to the tactics above, it helps to be well prepared with your lessons so you aren’t fumbling around and losing attention. If only one child is disruptive, then I call on the child to answer or act out or someway actively participate in the lesson. It gets them back on the right track. And as a parent when we had a report of our own child being disruptive, we took it very seriously and followed up to be sure the behavior had changed. Thank you for sharing! Enjoyed the reader! My18 year old has recently accepted the call to youth Ministry. He runs an activity night with youth 4-13. He bought a light up stick from the $ Tree and calls it, The Talking Stick. Only the person holding the stick is allowed to talk. I teach a group of preteens and teenagers. One of my strategies is to say, “If you can hear what I’m saying, do what I’m doing!” And I’ll usually just clap a lot or do something silly! It usually works quite well to regain their attention. It’s definitely tough at times to draw that line where you go from formal to informal, because you still have to stay somewhat structured! We just started a new program called Elevate at our church and our class is large with the grades ranging from 1st-6th grade. The best way I have been able to grab their attention is I say Macaroni and cheese and the kids say everybody freeze, or hands on top everybody stop. They really like this. Also I have handed out yellow tickets for those who will not comply with the rules and had several warnings. If they receive 4 yellow tickets a semester they loose game time. I have to large group of kids that don’t get discipline at home. The parents don’t come to church with most of them. It’s been tough but we have come a long ways. First to get their attention I say hand up, over mouth. That means they point one finger toward Jesus and put one finger over lips. During teaching time i have a ball I my hand. That’s our talking ball, you have to be holding the ball to talk. SometimesI want them interacting during class but not everyone at once. So if I ask them something and or they have something to say about the lesson they must have the ball I hand. Then I have a clothesline hung up. First part is go, then middle is Caution and the end is Stop. They all made butterflies on a clothes line and if they get out of line they get a warning, clothes pin gets moved to caution, if the get in trouble again I move their pin to stop and they loose the treat for the day. Of course i always talk to them. Ir habe a helper do it. And to be honest i always tell them the first time, i don’t want to have to move a clothes pin so they get 2 warnings. I do think we have to remember kids are different and some are more active, etc. So I use helpers setting beside some that I know need extra attention. I also separate kids that pair up and disrupt the class. And they know if I have to spend extra time teaching they are losing fun time. I remind them of that if I need to. But like I said in the beginning, I have kids from broken homes, parents on drugs, some of tgem was born on drugs, parents in prison and worse. So i always remember they really need love. I do everything in a respectful manner. I always say thank you, please, etc. Please pray for my Children’ s Ministry. May GOD Bless the children, their Family and you. I teach Discovery Time in a public school- its like Sunday school, for 1/2 an hour, once a week. It is a lot of fun but challenging as well. The grade 5 class I teach is pretty fun and controllable, but the grade 6 class is crazy! So thank you for this post. I will be using some of these suggestions. One that I do is: At the beginning of class the ‘team’ gets 3 points, with each warning they lose one. Once they are gone, they are gone. No getting them back! If they keep all 3 points by the end of class, they get a little treat. If they don’t have them all they don’t get anything that class but all the points that are left over get recorded and once they have 10, they get a big treat. Like ice cream, or cake, etc. I’m a former school teacher of mostly 3rd graders. Now I’m teaching 4 and 5 year olds in Sunday School. I need some ideas to hold their attention. I don’t know that taking away snack or play time is the answer for these little ones. Help! Have you tried the whole class response sayings? Physical activities are good at that age. Having them do hand motions to go with songs or Bible verses, for example. We have Master kids club on Wednesday nights. I have a helper and we take turns teaching every week. We usually average four to five kids. They are 9 years old and in 2nd grade. They are rounders. It’s embarrassing that 2 adults can’t control 4 to 5 kids and keep them interested. This is my first time ever teaching. The other lady is used to teaching older kids. One of our kids appears to have a learning and speech disability. All of the kids except for one come in on the bus. We pick them up and bring them in, feed them, then assemble together for about 15 mins and then go to class. We are in class about 20 mins and it’s time to go for game time. Game time is about 20 to 30 mins and then back to class. How in the world do you teach bible truths, try to get them to memorize scripture, do a short craft and keep control. How do you get anything done. I need help. I found myself getting stern with them. They are so out of control. I don’t know the parents so there’s no help there. And they get no biblical teaching when they are not there. I don’t know what to do. Hi Angie! Definitely challenging. I’d recommend connecting with someone at your church that seems to somehow make it work – whether it’s the supervisor of Master Clubs or another teacher that has more experience. Ask them for some pointers & advice – they’ll hopefully be able to advise you since they know exactly what you’re dealing with.